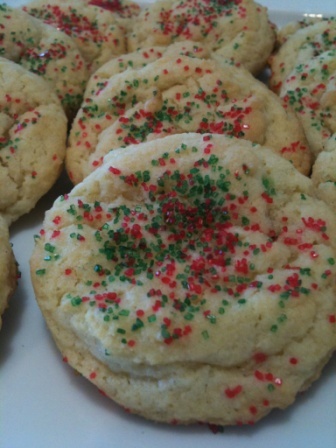 I was on a mission to make a chewy sugar cookie that was quick and easy. No chilling and rolling out the dough, no cookie cutters. Just mix, drop and bake. After trying several recipes I had an “aha” moment and decided to incorporate some cream cheese into my recipe. Result is a chewy sugar cookie that was very easy to make. I hope you enjoy it! Let me know what you think. In a bowl, stir together flour, baking soda and powder, set aside. In a large mixing bowl, cream together butter, cream cheese and sugar until smooth. Beat in the egg and vanilla. Gradually blend in dry ingredients. Using a small cookie scoop, drop round balls onto a cookie sheet lined with a Silpat. Sprinkle with raw or colored sugar. Bake for 7-9 minutes or until lightly browned.